Sustainability is the key word of this train with the Bombardier's ECO4 technologies. Today the ECO4 portfolio includes 15 energy-saving solutions that serve as the backbone of modern fleet management and rail technology. Bombardier has launched its new OMNEO: the world’s first articulated double-deck multiple unit. This technological breakthrough provides an extra wide carbody, wide gangways and superior accessibility, and, for the first time, the benefit of visibility throughout the train. Flexibility is the main feature of the OMNEO innovative train concept. It offers an exceptional range of train lengths from 81 m upwards with increases in increments of 10 to 15 m. Moreover, additional intermediate cars can be added during the lifetime of the train. Maximum speed ranges from 140 to 200 km/h, which makes it the perfect train for commuter, regional and intercity applications. Light-weight vehicle construction combined with excellent weight distribution minimises axle load and creates flexibility for multi-voltage cross-border versions on all European networks. 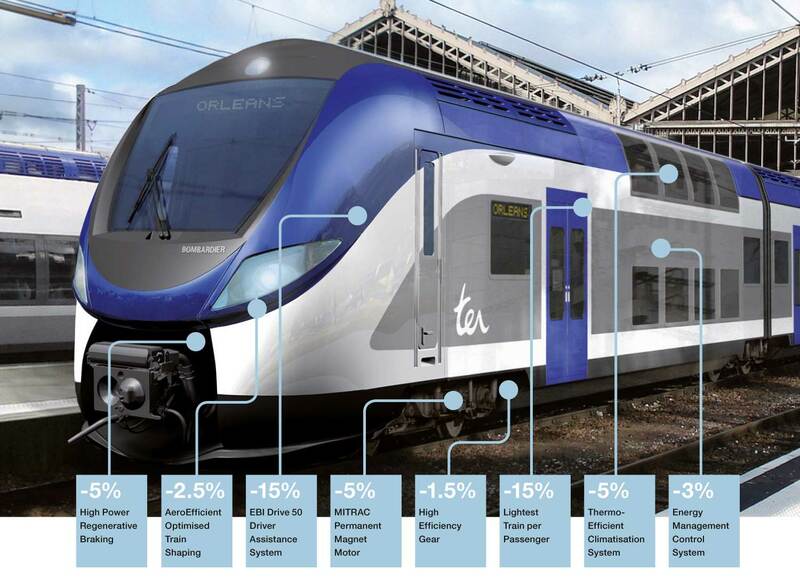 Sustainability is the key word of this train with the Bombardier’s ECO4 technologies. Today the ECO4 portfolio includes 15 energy-saving solutions that serve as the backbone of modern fleet management and rail technology. – MITRAC Permanent Magnet Motor: compared to inductor motors of the same size, this compact and powerful PM motor system uses less energy, facilitates motor cooling, improves motor performance, reduces vehicle life-cycle costs. Moreover, the OMNEO train offers single stage gear boxes, further reducing losses in the traction chain. – ThermoEfficient Climatisation System: after traction, HVAC has the highest energy consumption on a train. The ThermoEfficient climatisation system not only offers significant energy savings, it also optimises passenger comfort through variable fresh air rate and even temperature levels. Alstom GE deal at its final stage. How the market will react? Is Public Transport really cost-effective? A Siemens study.